A 80’s Apple II BBS is running on a real Apple IIe with real 5.25 Duodisk. 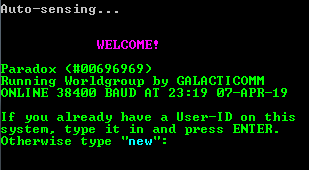 The Software is GBBS Pro V1.2 DOS3.3 – developed at the beginning 1980’s. This is a real Apple II BBS, a real BBS with the hardware setup from the beginning 80’s – the Apple, the disks, the clock card a.s.o. … nothing is built past 1984. You will have to wait from time to time till the disks have uploaded the data. You will have to understand how a board developed at the beginning 80’s works. And then … you will be a member of an exclusive group of people who share information and knowledge on the board and who enjoy this great feeling of the real BBS-Style! The 8 Bit Wiki Board – where to find all about and all for your classic computer. Cloud Service for all classic computer. Moreover are a lot of VisiCalc sheets for download offered. 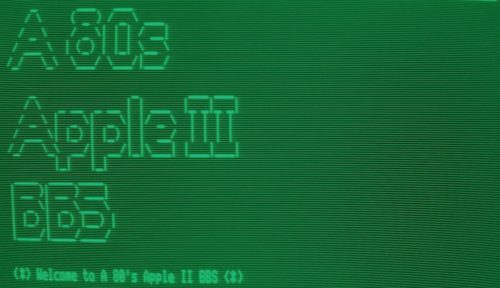 Connect to A 80’s Apple II BBS Now!